“We take a bar of steel, heat it up in the fire, hammer it and give it life and character,” says Chris Gavin, blacksmith and owner of Mandala Creations. In the showroom, hand-forged metal works with presence extend the long heritage and individual expression of blacksmithing. 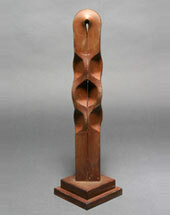 Decorative wall sconces and an ecclesiastical bench patiriated to resemble wood revive the Gothic spirit. 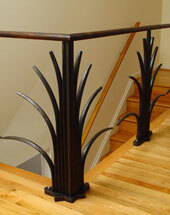 Traditional fireplace tools and turned railings rest against a wall. 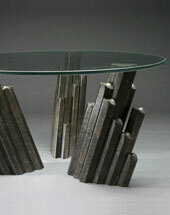 The base of an elegant, glass-topped table brings fluid grace to the weighty metal. Its sinuous legs, joined with brass collars, end in floral motifs. Sitting on top, an abstract sculpture is composed of clustered bars that rise together and curl like fern fronds unfurling. “I'm always inspired by nature, but as abstractions, simplifications. There are restrictions with the material,” says Gavin. A graduate of Edinburgh College of Art, he received a master's degree in sculpture 20 years ago from the Maryland Institute College of Art. Nearly every piece created at Mandala is custom designed, mainly for residential use. “It's most satisfYing when I can fuse the sculptural and functional, and put it all together,” he finds. With two full-time assistants, three working forges to heat up the metal, hydraulic presses for stamping, power hammers and anvils for finished, refined work and more, Mandala makes everything, down to the rivets and hinges that hold together a piece. Mandala Creations is open from 8:30 a.m. to 5 p.m. on weekdays. Phone 410-366-8813 or visit www.mandalacreations.com.